IHC follows the notice and takedown process put in place by INHOPE (Journey of a report) and record information in the ICCAM system. Reports will be assessed according to the national law and hotline baseline criteria. When we receive CSAM reports from the public via the hotline, our content analyst will assess the material (image or video) against the national baseline criteria to determine its legality and classification. The analyst will analyse, classify and record all the necessary data to notify law enforcement and enable the possibility for the content to be removed. 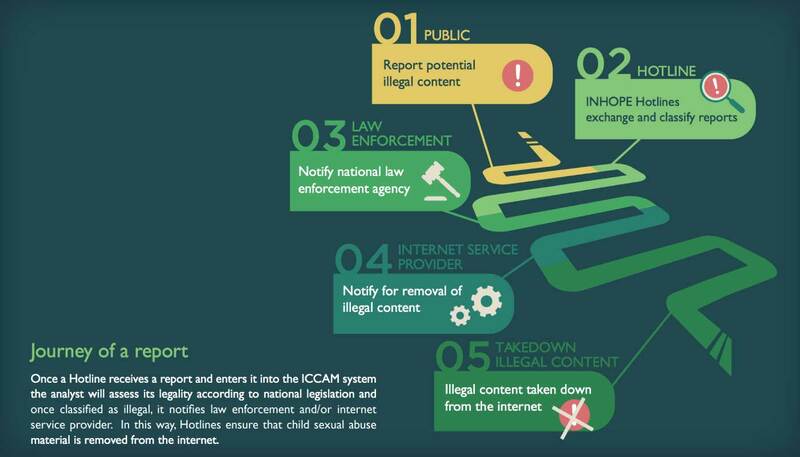 If images/videos are found to be illegal, a notice/takedown request will be sent to law enforcement, ISP or other INHOPE hotline where the content is hosted (server location) for removal. The police, ISP or Hotline in the hosting country will commence the takedown process and record the case. Where victim identification is concerned, the police will take action to identify the victim. Our priority is to help victims of online child sexual exploitation by first removing their images and then identifying them for appropriate services. Where needed, we support police to investigate and prosecute the online child sexual exploitation cases. INHOPE global member hotlines are working to fight against Child Sexual Abuse Material on the Internet.